iReporter who lives nearby says she saw "huge tower full of fire"
BEIJING, China (CNN) -- A massive fire engulfed a newly constructed, unoccupied luxury hotel in central Beijing on Monday night as crowds watched a nearby fireworks display marking the end of Lunar New Year celebrations. The cause of the blaze at the 40-story Mandarin Oriental is unknown. The cause of the blaze at the 40-story Mandarin Oriental is not known and there were no reports of injuries, according to CNN staff members who were at the scene. The fire began about 9 p.m. and continued to burn an hour later. A plume of flames shot from the top of the structure as the fire quickly spread. iReporter Jean de Villeneuve lives about 200 yards (200 meters) from the fire and said she watched it for about an hour before firefighters got it under control. De Villeneuve, who is originally from France, said she was surprised at how close spectators were allowed to get before authorities established a perimeter. De Villeneuve said she and others were able to get within 60 yards of the fire. The state-run Xinhua news agency reported that more than 1,000 people in the area were evacuated, "traffic controls were imposed" on a major highway and authorities temporarily stopped subway service on a line serving the area. iReporter Fred Rice, a British national who lives in Beijing, said "the top of the building was exploding." "We weren't sure if it was gas canisters or what. It was a spectacular sight for sure," he said. "It was spreading incredibly fast. It was obvious that there was a lot of debris on site -- that debris ignited very quickly," Chaytor said. "Fire took control of building [and] within less than 13 minutes, it went from small flames to being totally engulfed in flames." He said a crowd of onlookers gathered around the scene, as well as fire and emergency crews who worked to control the blaze. "There was a quiet concern for people that may be involved, working in the building or close to construction site," he said. iReport.com: Are you there? 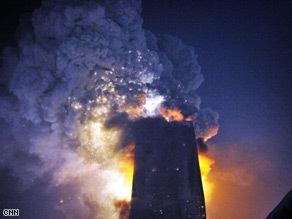 The fire reached past the 30th floor, but did not spread to any adjacent buildings. The hotel is next to a newly constructed tower for China Central Television (CCTV), but no one has moved into that building either. The blaze erupted in the final hours of the Chinese Lunar New Year celebration as people set off fireworks across the city. Xinhua reported that Beijing residents were supposed to stop selling and lighting fireworks by midnight. iReporter de Villeneuve said she suspects many people in the city were trying to use whatever remaining fireworks they had before the deadline. iReporter Rice said he was watching fireworks nearby when he noticed that fireworks were being set off near the buildings. "Then we looked closer and saw the flames come from the top of the building," Rice said. "Soon became apparent that the building was on fire." The modern, angular building was a sign of Beijing's recent transformation and modernization. It had been scheduled to open late last year, but the opening was postponed until this year, though most of the building had been constructed. According to its Web site, the Mandarin Oriental-Beijing is the flagship property in China for the Mandarin Oriental hotel chain. The tower stands more than 500 feet high and contains 241 rooms, Xinhua reported. All About Beijing • Mandarin Oriental International Ltd.